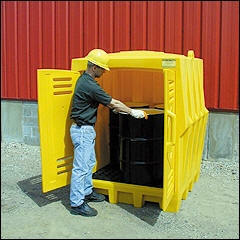 Largest selection of Spill Containment Pallets -Low Prices. 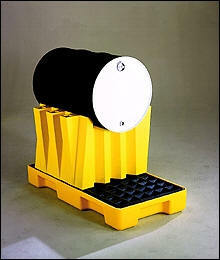 Types of Spill Pallets: Spill containment spill pallets come in many options to control drum or container leakage. Most of our spill pallets are made of high density polyethylene and are made in the USA. 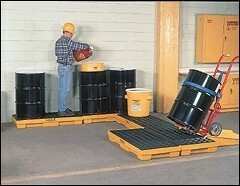 1) Spill Pallets/Spill Platforms - Traditional pallets for holding one to eight drums. Modular units that can be connect to handle an unlimited number drums. Most modular units are low profile so drums can be loaded on them off of wooden pallets. 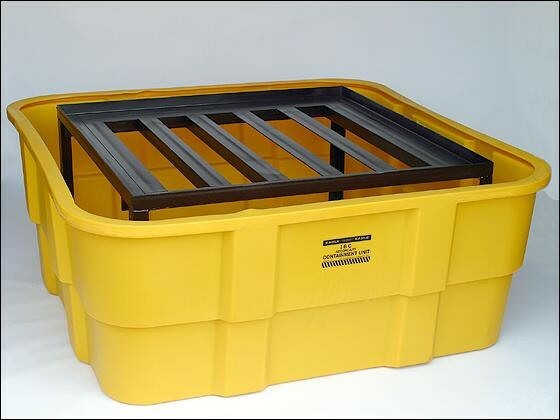 Higher profile spill pallets for more sump capacity or inline pallets to save space are other options available. We also carry fluorinated models if you have aggressive fluids that are not compatible with polyethylene. 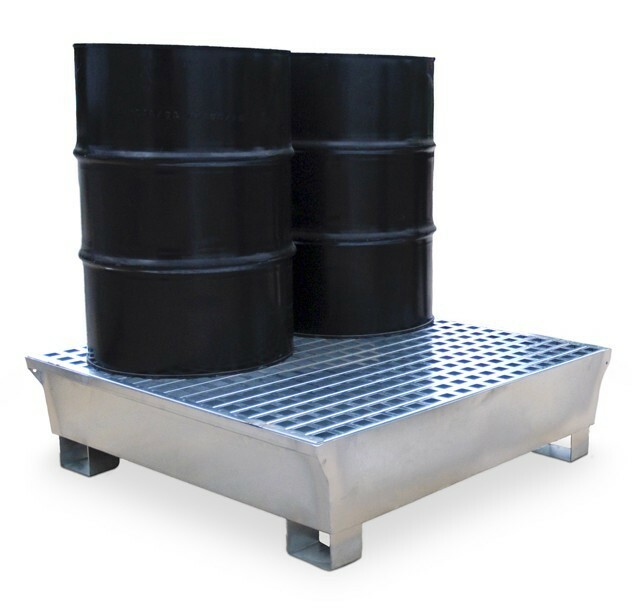 2) Economy Spill Pallets/Basins - Our economy models include a one, two, and four drum model without grates that is more like a drum tray. Our NEW flexible models come in 1 to 6 drum sizes. Available with or without grates. The PVC flexible sides save on shipping cost because they do not have to go LTL. 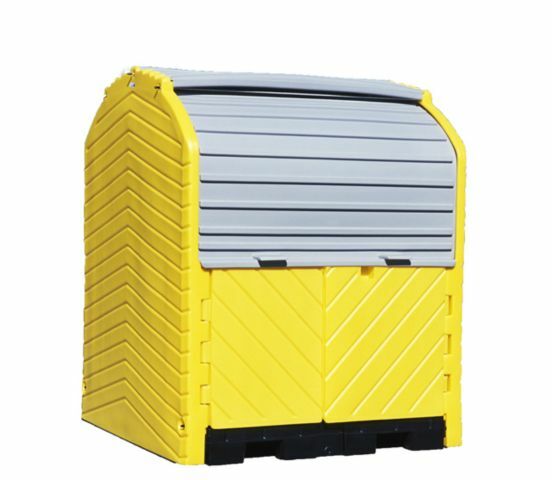 3) Outdoor Drum Storage - With our large selection of covered outdoor spill pallets you will find the solution you need. We have a spill pallet building, roll tops, lift tops and flip top covered pallets. This is one of the largest selection of hard top spill pallet choices on the internet. View our videos on many of the products. 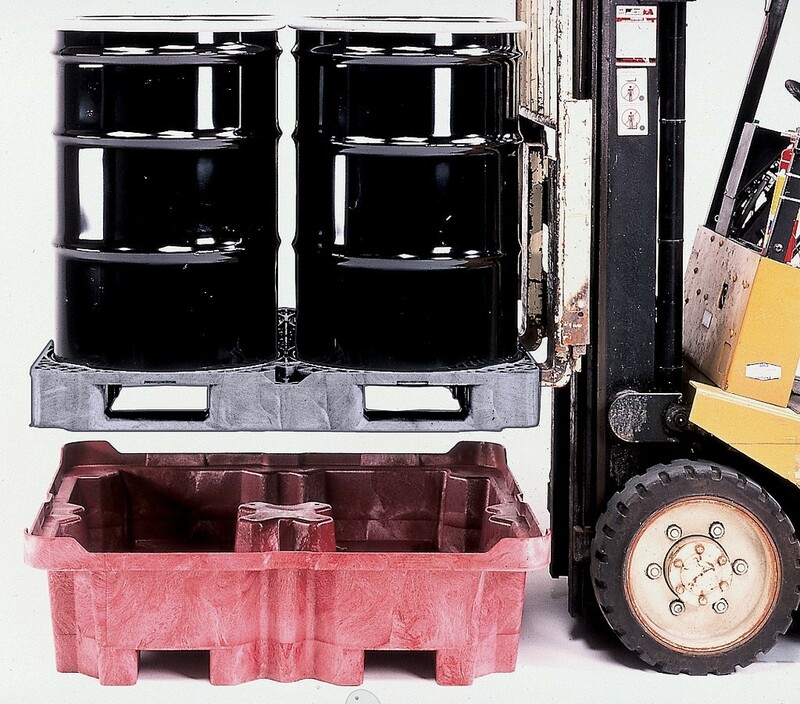 4) IBC Spill Containment Pallets - Besides standard IBC pallets there are also modular and hardtop options available. 5) Stackable and Drum Dispensing Workstations - Space savers that also allow you to safely dispense chemicals. Also covered units that can be secured and used indoors or outdoors. 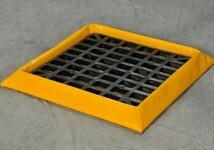 Spill Pallet Construction: As noted above all of our spill containment pallets are made of high-density polyethylene (except portable products) and most models have removable poly grates for easy cleaning. It is important to note that before you purchase check the load capacity and spill capacity of the spill containment product to be sure it fits your needs. Review our Chemical Resistance Guide for High Density Polyethylene here to be sure the chemicals at your facility are compatible. We do carry fluorinated pallets for certain chlorinated solvents that are considered incompatible with standard polyethylene. 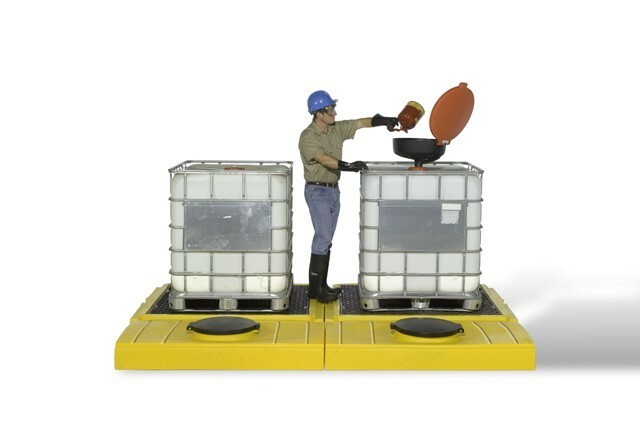 Compliance: Spill containment spill pallets help you meet SPCC, EPA Container Storage Regulation 40 CFR 264.175 and UFC Spill Containment Regulations. Our outside covered spill pallets help you comply with Stormwater Management Regulations NPDES, 40CFR 122.26 (1999). We are here to help. Feel free to Contact us if you have any questions. 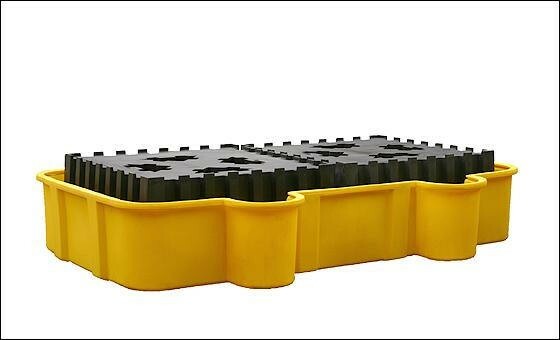 Description: Our large selection of secondary spill containment pallets and modular platforms are made of tough polyethylene. They will not rust or corrode. Removable poly grading for easy cleaning. 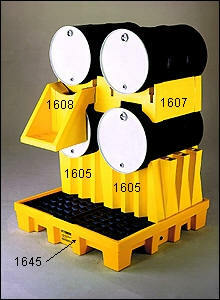 Available in 1,2,4,6 & 8 drum units. Ramps available for our modular system. All of this containment pallets can be set up in just about any configuration you want to fit your needs. We now also carry containment pallets treated with fluorination gas so the polyethylene is compatible with aggressive chemicals. Uses: Use our spill pallets outdoors or inside throughout your facility to comply with EPA regulations. Additional detailed product information can be found on order page for each type of pallet we carry. Special needs spill containment trays/basins that will hold one, two or four drums. Can also be used for smaller containers or as wash basins. All come without grates. Use on regular pallets for transporting drums. 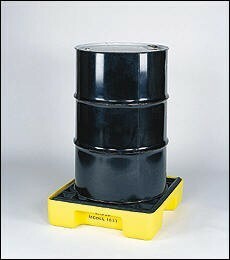 We also have a NEW flexible side containment pallet for 1, 2, 3, 4 and 6 drums. No ramps needed. Save big on shipping because they ship UPS not LTL. 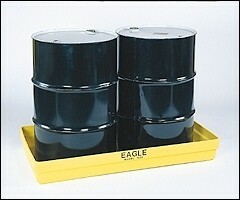 Uses: Economical solutions for temporary or emergency spill containment for your drums and small containers. Also used when transfering or shipping drums with in a facility or to other facilities. Use throughout your facility to comply with regulations. Additional product information on order page. Description: Heavy duty polyethylene construction. Resists weathering, corrosion, UV rays and is compatible with most aggressive chemicals. Uses: Use out doors to protect drums from the elements and to help comply with EPA regulations. 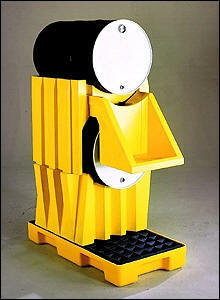 Description: Special needs spill containment trays and basins that will hold from 5 gallons to 400 gallons. Made from HDPE or polyethylene. 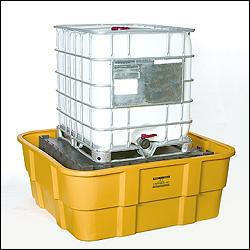 Uses: Economical solutions for spill containment for your drums, small containers and IBC containers. Use throughout your facility to comply with regulations. Additional product information on order page. 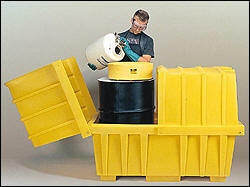 Description: Polyethylene solutions for space saving storage and dispensing or of 55 gallon drums. Mobile units for dispensing and covered units for dispensing outside. Accessories for 55 gallon drums include funnels, covers and absorbent drum top pads to catch drips and small spills. 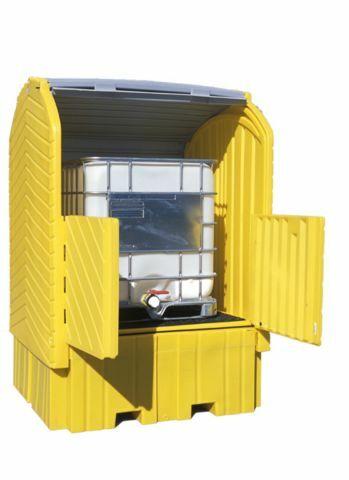 Uses: Solutions for 55 gallon drum storage and dispensing. Additional product information on order page. 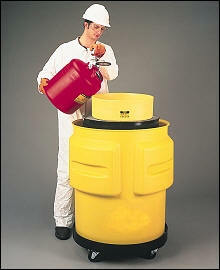 Description: Our portable spill containment products are light weight but made of strong and durable polyethylene. They are compact so they easily fit into vehicles or store easily on a shelf for when you need them. An economical alternative for temporary containment needs. Uses: Place on your vehicles or construction equipment in case a tank springs a leak. Or use them when you have a need for temporary storage of drums.